Hellsongs is an acoustic three-piece that plays what people seem to describe as Lounge Metal. That means old metal classics performed with startlingly clear and crystalline female vocals, soft guitars and organ and two male choir-boys. A cult hit online and on Scandinavian radio in the early 2000s. Harriet Ohlsson, Johan Bringhed, and Kalle Karlsson formed the group in the fall of 2004 and played their first show at a barn in rural Sweden. A cult hit online and on Scandinavian radio in the early 2000s. Harriet Ohlsson, Johan Bringhed, and Kalle Karlsson formed the group in the fall of 2004 and played their first show at a barn in rural Sweden. The group recorded three demo tracks by the time 2005 rolled around; the songs were picked up by Sveriges Riksradio's P3 (a Swedish national radio station similar to BBC 1 and CBC 3) for rotation on the heavy metal show Rundg?ng. 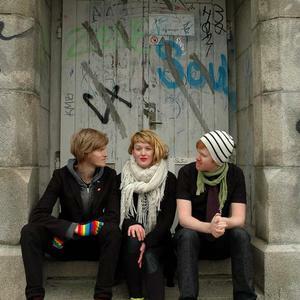 Hellsongs released their debut EP, Lounge, the following year. A full-length album, Hymns in the Key of 666, followed in 2007.